You know when you think you went somewhere the year before last and it turns out it was three years ago, well that. 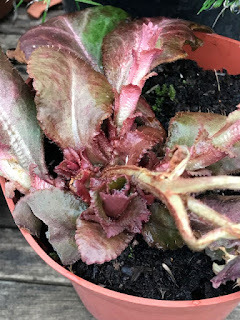 It is three years since I last went to the Hardy Plant Society AGM when it was hosted in Nottinghamshire I had enjoyed it so much and bought some fantastic plants from the plant sales that were there, I knew it was time I visited again. The AGM moves around the country and is hosted by the relevant local group so sometimes it is easier to get to than others for me. This year it was in Tiverton. Now those of you who know I am based in Leicester may look at Tiverton on a map and think it is a bit of a hike. Well it is, but if you are going to go on a hike going to one to Devon is no bad thing. I decided I would travel down slowly stopping off at a garden or two on the way the day before, then drive back after the day was done. This was a plan. This was a plan that did not account for our cold wet weather we are currently having. Friday turned out to be a dull rainy dismal day and so I changed my plans to just visit one garden, Knightshayes Court which was close by where I was staying. I shall blog about that visit shortly. The day was constructed of plant sales and two lectures with the AGM in the middle. The first talk was from Dr Julian Sutton of Desirable Plants and then in the afternoon Nick Macer of Pan Global Plants. Both also had a stall of plants for sale, and yes I bought something from both of them. 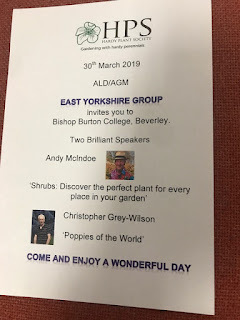 There was also a very important reason I wanted to go to this AGM, I had been nominated to be a Trustee of the Hardy Plant Society. I attend my local group meetings fairly regularly and I am really interested in getting more involved with this great group of gardeners. Their knowledge and experience outstrip mine by a huge degree and their friendliness and willingness to share this knowledge appears boundless. I was very honoured to be elected to be a trustee. Grevillea Canberra Gem: I had one of these some years ago and a harsh winter finished it off (2010, yes I hold this year in my mind as the destroyer of many prized plants). I shall plant this in a more sheltered spot to help it survive. 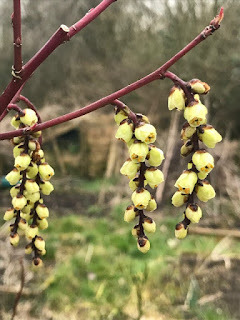 Stachyurus chinensis 'Celina'. 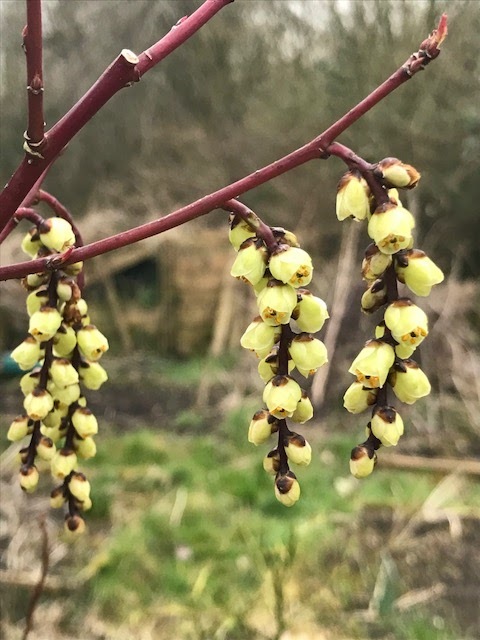 Now I already have a Stachyurus praecox, which is small, weedy and has never flowered. 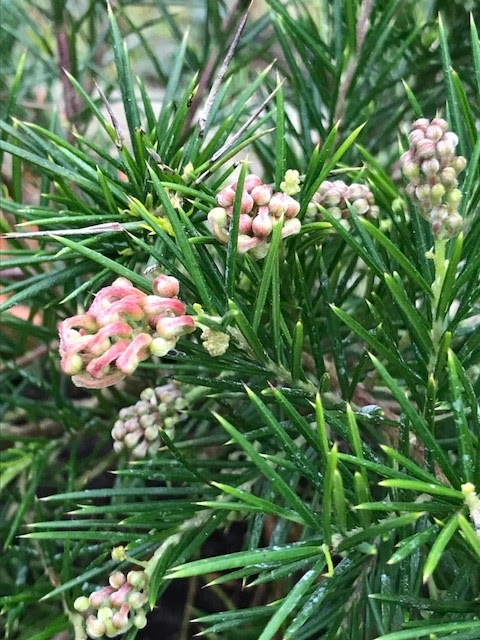 I keep hoping this year will be the year it gets big enough to flower, but I suspect it will not. It has been a disappointment and so buying a different sort and one already in flower seemed a wise move. 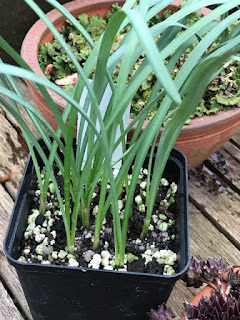 I also bought this pot of Galanthus 'Elfin', not another flipping snowdrop I hear you cry! Yes I know, I know, but there are a few in the pot and it was not expensive by any scale. and finally this Chrysoplenum macrophyllum which I love the colour of the foliage and I have high hopes for. I did actually buy one of these three years ago at the last AGM. Sadly I managed to kill it which I was always sorry about. I am going to plant this in another part of the garden which hopefully will suit it better. One of the benefits of HPS membership is their annual seed distribution scheme. 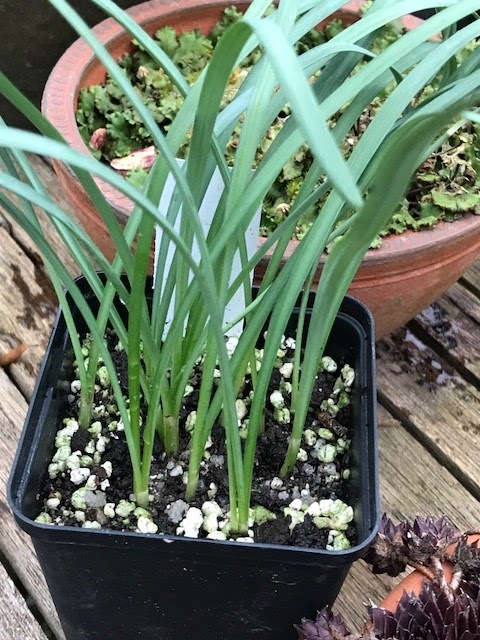 Members donate seed and then it is available to order. 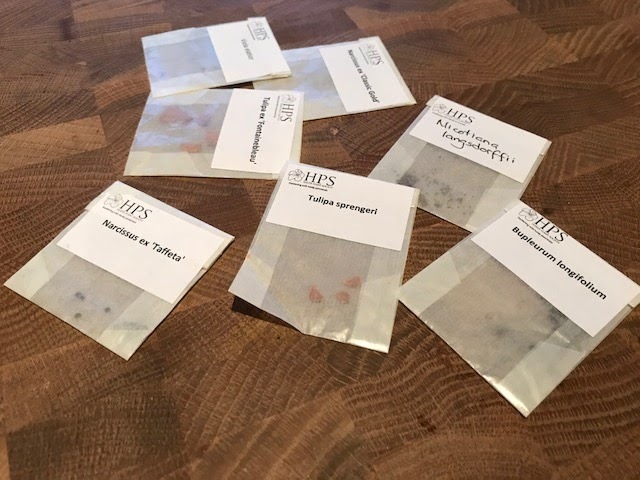 The seeds themselves are free and there is a small administration charge. There are seeds available through this scheme that are hard to find anywhere else. This helps keep these wonderful plants growing in our gardens. I might have picked up a few packets whilst I was there. I drove home happy with my plants by my side. A seatwell full of plants equals a happy day. Now I am looking forward to next year's event. It says it will be a wonderful day and I have no reason to doubt this. Congratulations! Will pay more attention now I know some of the illustrious Trustees! Where is next year’s event? Hi - thanks Barbara, its in Beverley, near to Hull - looks like it will be a good day. 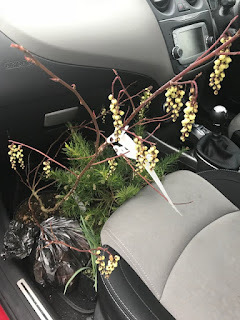 A long way from Leicester to Devon for the event of the Hardy Plant Society but I'm sure it wass well worth it, Lectures on plants are always interesting and you bought some nice plants. A pity of the bad weather but so good you could visit Knighthayes Court. Spring is there but the weather is not yet spring-like, anyway I continue rosepruning today. Its about a 3 hour drive, so yes, a bit of a schlep, it was worth it though and I got to meet up with some twitter chums which was huge fun. Thanks too for posting some info about the day. Karen posted some photos, but otherwise can't find much online - even on HPS website. Guess we'll have to wait for the national newsletter. I've sent congrats to Karen too! Many congratulations Alison! The HPS is a great society. I've been a member for nearly thirty years now. Sadly I can't get to my local group meetings these days but do enjoy long distance membership of the snowdrop group.